Drilling the holes in the No 984 plane pre-prepared and surface ground sides which will receive the integral riveting from the bottom. The fixings used here have a 3/16 Whitworth thread to work within the existing holes. 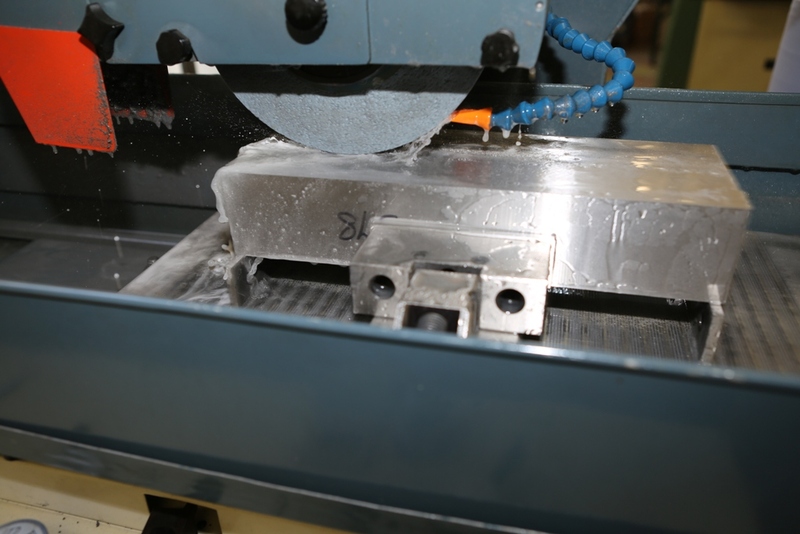 I hand cut the threads whilst they are in the milling machine so they are a little small to go through 1/2″ steel. A lot of care and patience is needed here. This means I can only take one or two rotations of cut at a time and then remove the taping tool and blow everything clean, then repeat until I am through. Now and again I push my luck and this is what happens. This is probably about the worse horror because I have a large piece of the tap seized in the tapping hole with a jagged shard of HSS tap sticking up. If this couldn’t be removed then I would have to spend the best part of a day to grind and drill another holding plate. 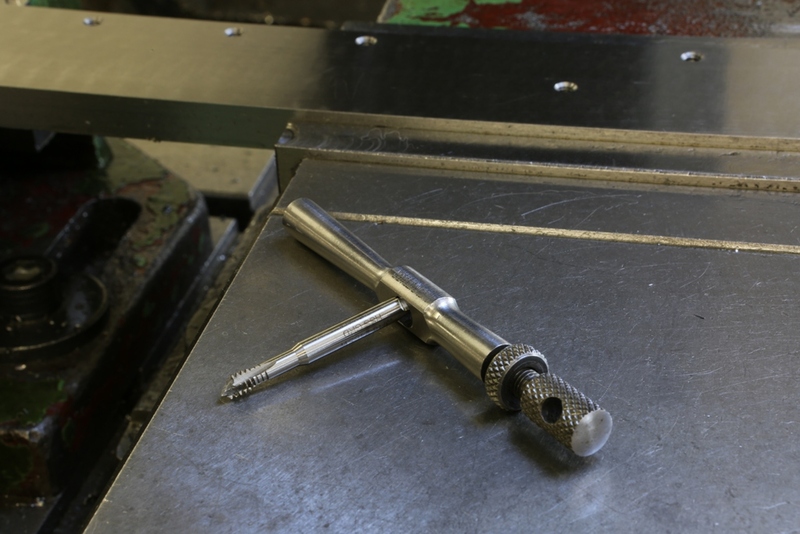 However, whilst it was in situ I was able to write another programme to mill the broken tap away with a very high quality tungsten carbide end mill. 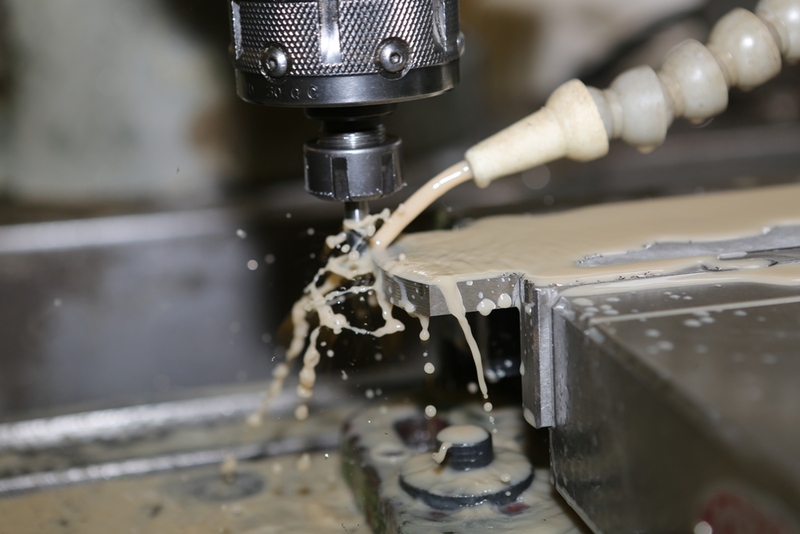 This could have only worked in the CNC as it needed a consistent very slow feed rate. It leaves me on a bit of a high when this works. Not only did I remove the broken tap but the original thread and true axis was maintain. This is extremely important or it would have had to be scrapped. Sometimes I like to mention this sort of trivia as it is a whole part of the whole process, often unseen. As I have said before, it is not just the tools I make but the tools I make to make them with. 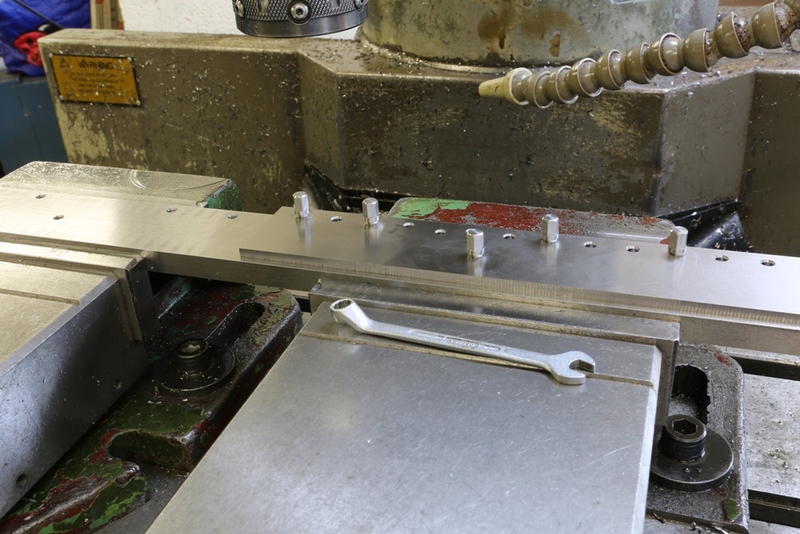 This is the end of the building process for the holding tool, showing the jig screws. Also showing the mirrored side on the left. 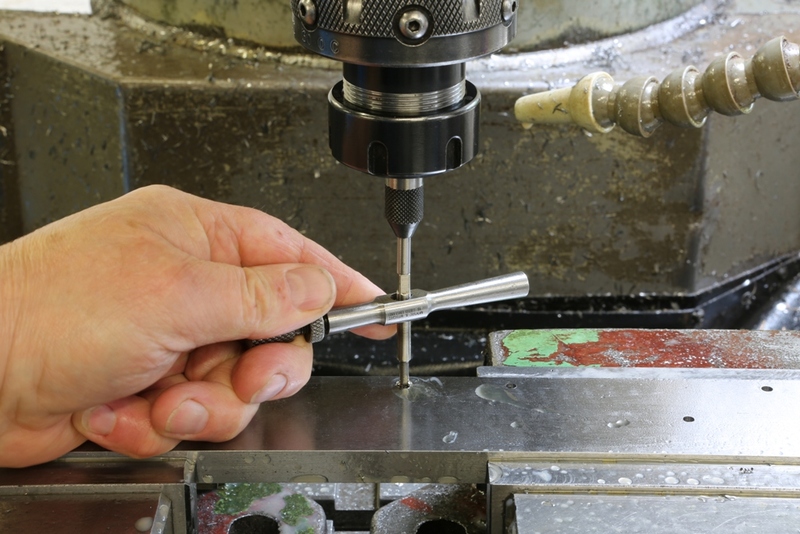 Mirroring or pair handing is necessary where there is chamfering and countersinking involved. After use this holding tool will go into my cupboard to join all the others, as each tool is dedicated to its type. It is sad that in the case of this one it will not be coming out again. 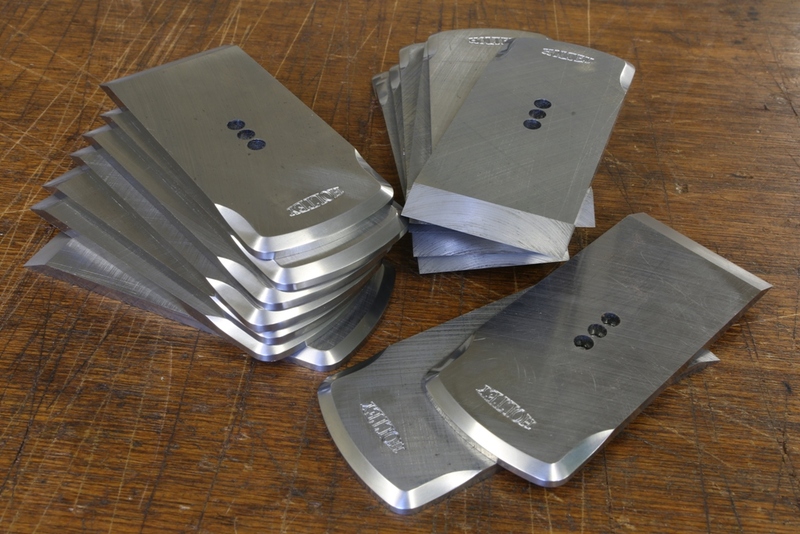 The blades arrived back from heat treatment and after many hours grinding and polishing they are now finished. Just packing them in oiled paper until the planes are ready. The hardening is the only thing I outsource. Everything else is made inhouse. One of the boring sides of this detail. 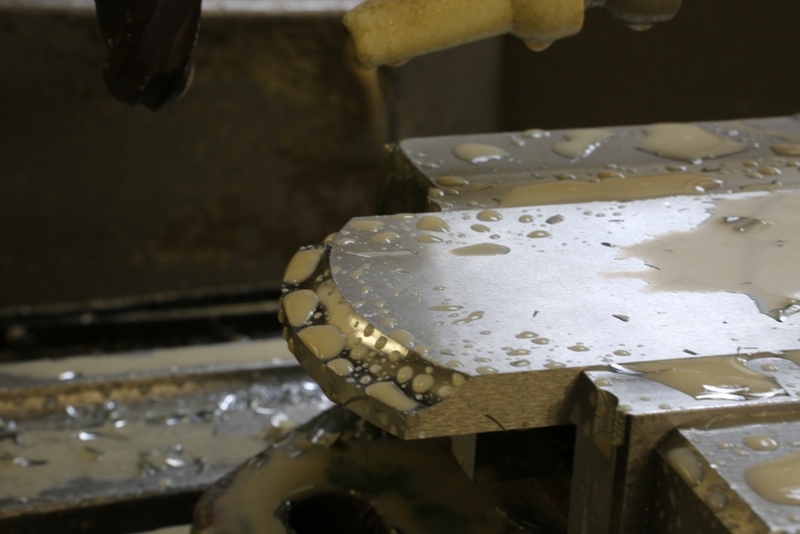 It is no simple polishing job as the valleys formed by the mill are very hard to smooth out. 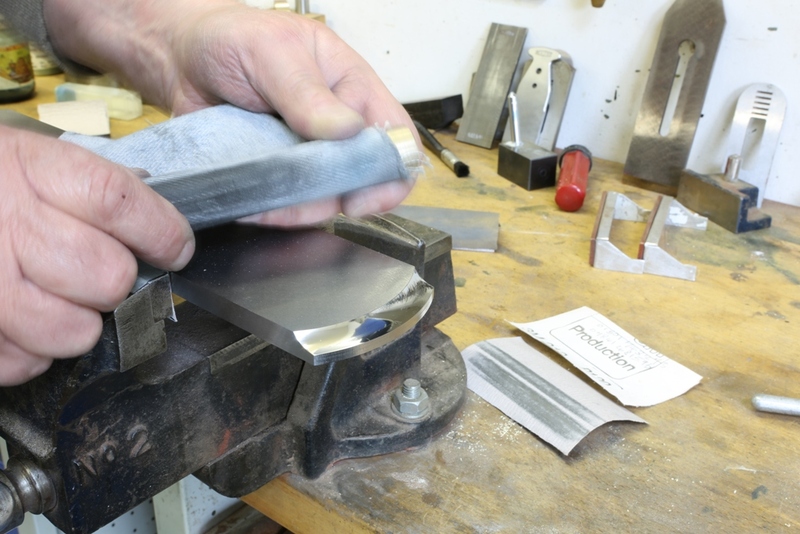 It is a case of starting with a coarse abrasive and working down to 1200 grade and then I wrap a piece of denim cloth infused with metal polish for the final polish. That is a reflection of my magnetic tool rack which looks like a row of vertical scratches. It seems odd doing polishing at this stage but it is the sequence which I choose to do the work in which gives me the finish. When all the riveting and adjuster recessing are complete I can surface grind the inner parts so everything is sharp and pristine. A little bit more of my daily drudge and a little bit more pain. This is not so kind on my mill. I use 4 cutters in the forming of this detail for the front and rear bow. 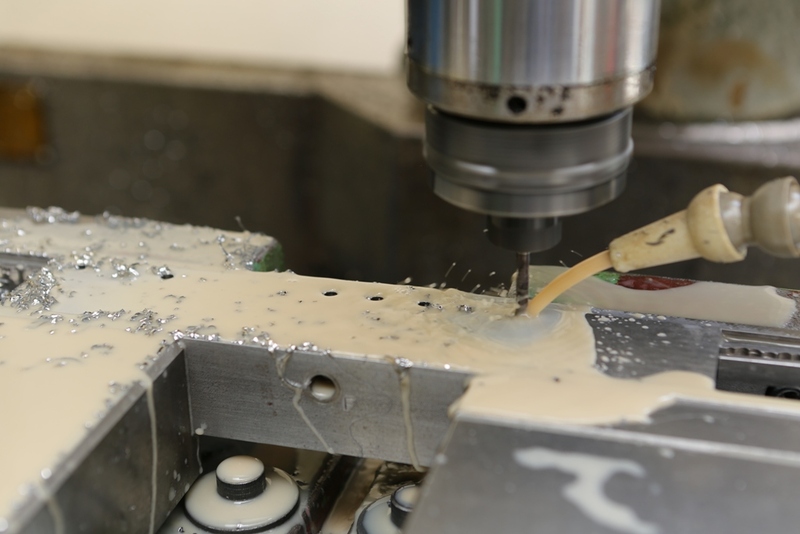 When the milling operation is complete there will be at least two days polishing them. Lots of sore hands and fingers. The last time I did this (on No 983), I had to have my hand stitched up by the local doctor. 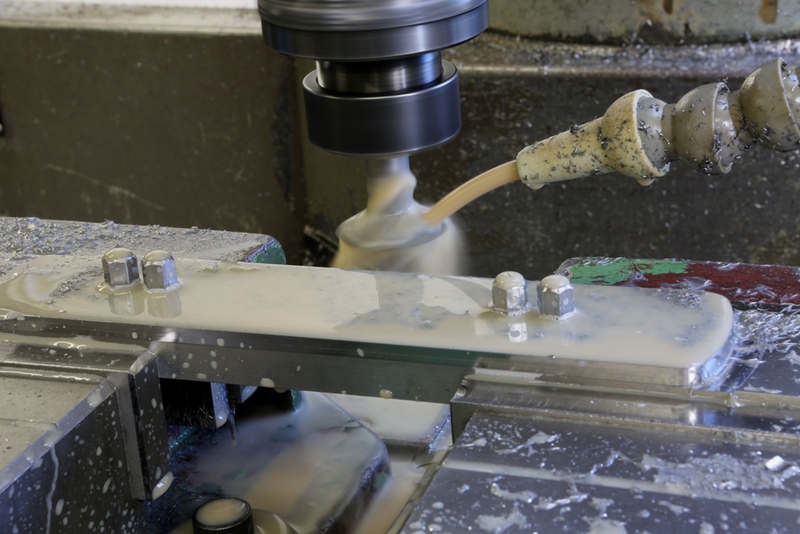 The surface grinder has been the busiest machine in my workshop for the past few years. 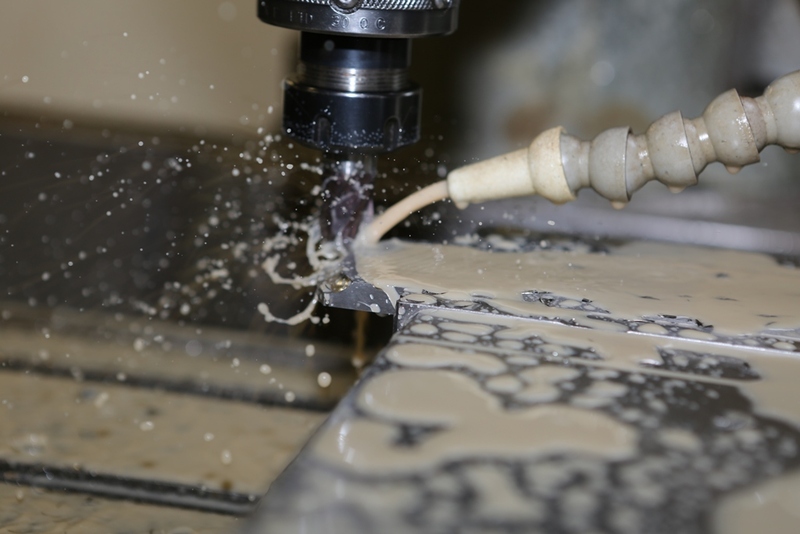 All my sections, after size adjustments in the milling machine, are precisely ground all round. The same with all the tooling and work holding I make. This is necessary to get a good reference throughout all my work. These are the bottoms being ground on their edges insuring that they are square and parallel. It is not often I use a flash but it is nice how everything has been frozen in time. I have also been busy during this time with the blades. 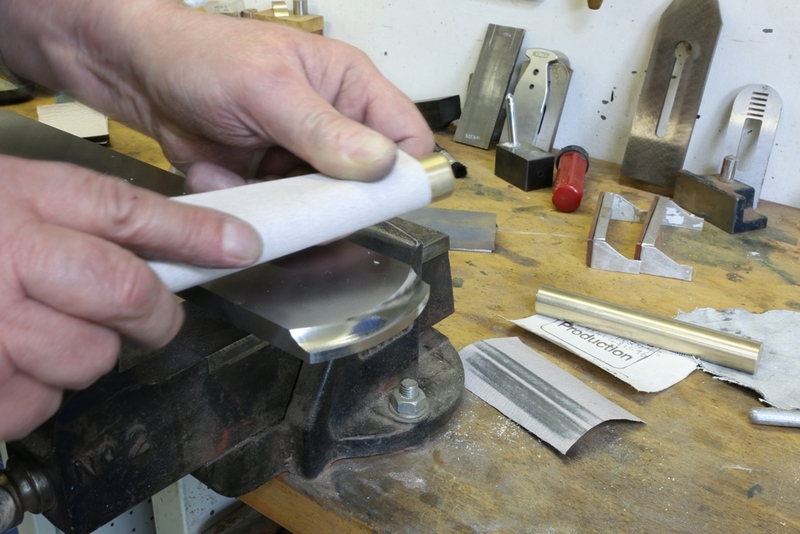 The blades are being profiled in ‘Siamese pairs’ for easier work holding. 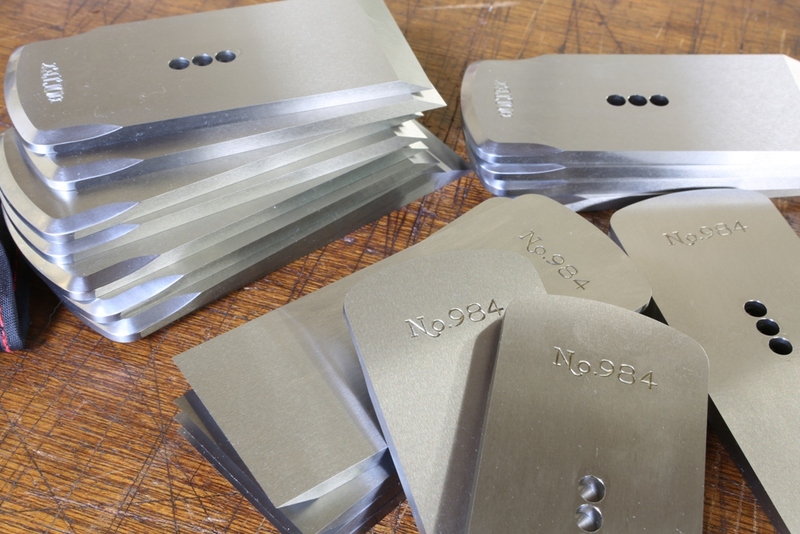 These have already been stamped with the HOLTEY logo in the fly press, I do this first as the edges close to the stamping area can become distorted. After the blades are separated they need to have a bevel milled on and the chamfers polished before sending them away for heat treatment. 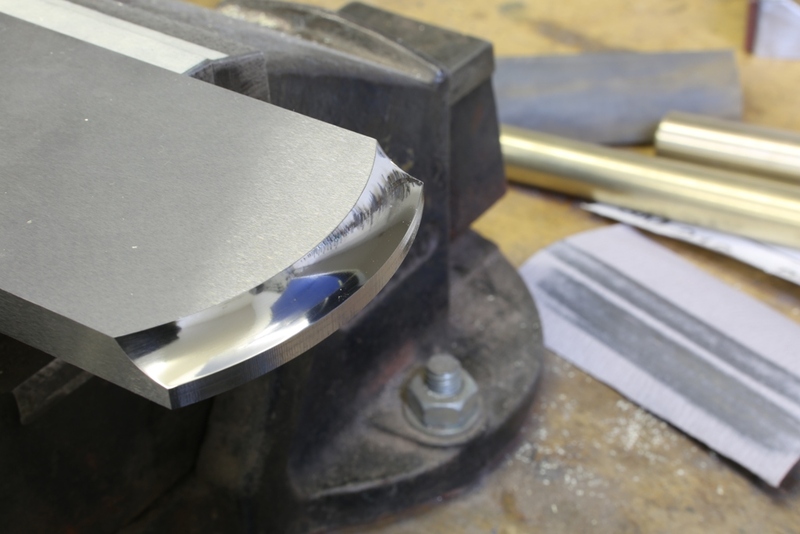 The polishing to the chamfers is important as it would be very hard to do after the blades had been hardened. When the blades come back from the heat treatment I will be surface grinding them all round.